The College’s Division of Media Properties, located in the Flanagan Wing of Weimer Hall, includes six broadcast stations, allowing students from throughout the College to gain experience in a competitive broadcast environment. 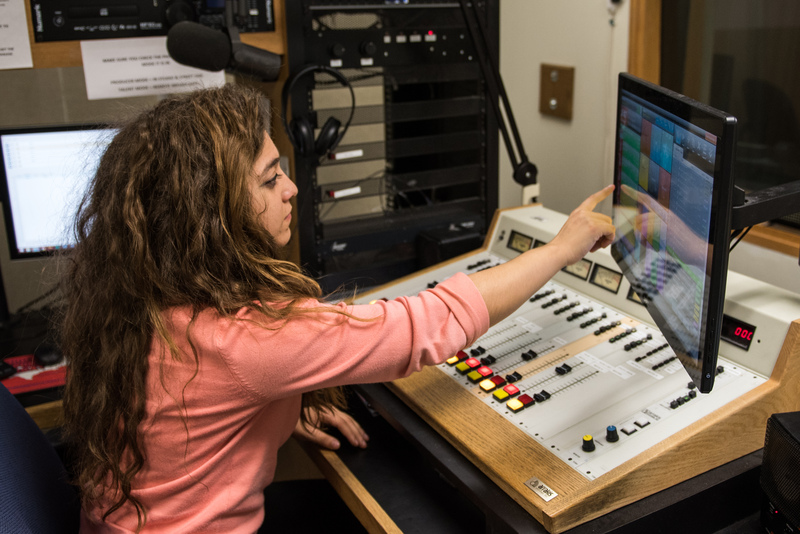 More than 300 students work in news, sports, production, management positions, web design, promotions and advertising for the radio and television stations each semester. Public broadcasting television station WUFT-TV/DT carries PBS and locally produced programming, including a weekday newscast produced by the College’s students. Commercial low-power television station WRUF-TV broadcasts local weather, news, traffic updates and videos featuring news about the University of Florida and Gator athletics. It also serves as a training ground for budding meteorologists. Commercial radio station ESPN 98.1/850 Gainesville (WRUF-AM) is the top sports station in the market, while its FM counterpart Country 103.7 the Gator provides residents across North Central Florida with the market’s only contemporary country radio station. WUFT-TV signed on the air November 10, 1958 with a mission to provide educational broadcasting to the UF and other schools within the broadcast area. In the late ’50s and early ’60s programming emphasis at WUFT was on instructional broadcasts. The station has evolved to featured PBS programming, local productions and an award-winning student produced and anchored weekday newscast. WUFT has three digital steams: 5.1 features high definition programming primarily from PBS; 5.2 features the “how to programming” APT Create service; and 5.3 features The Florida Channel and the APT World service. WRUF-TV6 is a low-power digital television station broadcasting over the air on channel 10.1 and on Cox Cable Channel 6 in Gainesville. The station carries local weather, news and traffic updates and videos featuring UF research and Gator athletics. Students receive training in weather forecasting. Gainesville’s first local radio station and one of the oldest in Florida, WRUF-AM, serves 13 counties as ESPN 98.1 FM (in Gainesville) and 850 AM with six hours of locally-hosted sports talk shows. The top-rated sports station in the market, ESPN 850/ESPN 98.1 also features Gator sports. WRUF-AM began broadcasting in 1928 and will celebrate its 90th anniversary in 2018. The ESPN network affiliation provides college students with an opportunity to be a part of UF’s heritage radio station. They produce short and long-form sportscasts, sports talk, production and social media. WRUF-FM, Country 103.7 the Gator, is 100,000-watt station and the sister commercial station to WRUF-AM. The Gator features a contemporary country format targeting adults 25-54 and consistently ranks in the top ten of all stations in the Gainesville/Ocala radio market. The Gator is also home to Florida Gator sports, providing live broadcasts of football, men’s basketball and baseball to more than 16 counties in north Florida. WUFT-FM and its repeater station, WJUF-FM, provide 24/7 news and talk to residents in North Central and Mid-Florida. WUFT-FM is a 100,000-watt public radio station serving 16 counties in North Central Florida, while WJUF-FM is a 20,000-watt repeater station that serves the residents of Citrus, Hernando and Sumter counties. Signing on in September 1981, WUFT quickly garnered a reputation as one of the top public radio stations in the country. WUFT-FM has three broadcast streams: 89.1 HD1 features news/talk; 89.1 HD2 is WUFT Classic (also available on 102.7 FM in Gainesville); and 89.1 HD3 features a top 40 music format and a student staff. GHQ is a dynamic multi-platform “radio” station run by students using mobile, social and digital audience engagement technology designed by media technology innovator Futuri Media. This research and development lab, operated with help from the College’s professional staff, is implementing audio-based app features and testing engagement, acceptance and likability through digital and social platforms in UF’s 50,000+ student community. GHQ is a contemporary hit-radio formatted product available over the air on 95.3 mhz in addition to transmitting on the College’s WUFT-FM HD3 signal to the Gainesville-Ocala, Fla. market. Audio and entertainment content is available nationwide through the GHQ app, which incorporates the entire suite of mobile audience engagement features designed by Futuri. Florida’s public radio stations have created the Florida Public Radio Emergency Network (FPREN) to communicate emergency information statewide through free, over-the-air FM radio. The FPREN Storm Center, housed at our College, provides detailed local weather information in a format designed specifically for radio listeners. FPREN also operates the Florida Storms app, which provides ongoing weather and emergency information on mobile devices. This service, for the blind and visually impaired, began broadcasting in 1992 in studios funded by the Florida Legislature. Volunteers read selections from books, newspapers and magazines to keep listeners in touch with their communities and the world. The broadcast is supplemented by the Minnesota Talking Book Network. The broadcast can be heard here.